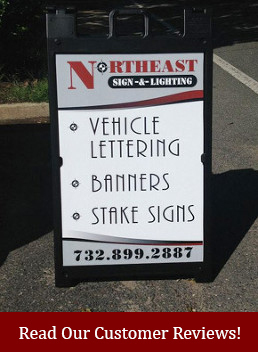 At Northeast Sign & Lighting we can supply you with all of your signage needs. Our team can design, fabricate and install a wide range of commercial signage products, as well as promotional items for any and all of your marketing needs. We have been serving the greater Jersey shore community for over 20 years; we pride ourselves on customer service and producing a quality product at a fair price. At Northeast Sign we make it a priority to get involved in the community. We have been an active Chamber of Commerce member for many years getting involved, networking with other businesses in the area and participating in community events. We offer quality signage products and services to both commercial and residential customers.